Visits: 12287 persons viewed this recipe. 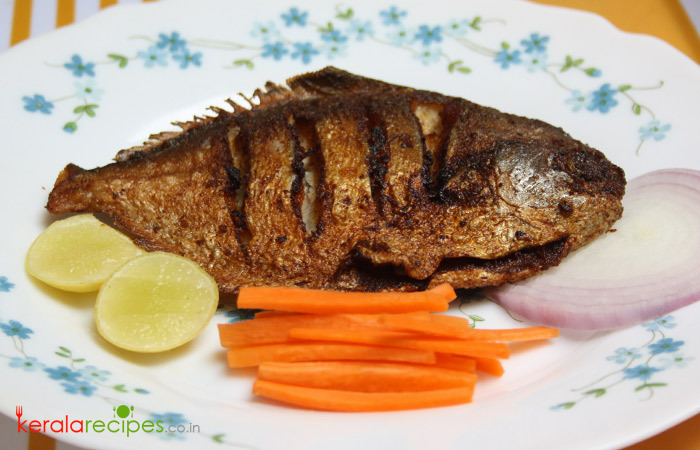 Raw mango Fish fry is an easy to prepare fish fry recipe. It is not a traditional food item. As raw mango is a seasonal item, I introduce this recipe as a seasonal food recipe. For me it was an experiment towards a variety fish fry recipe. Cut the fish into medium size pieces, clean it well and keep aside. Peel off mango skin and slice it into small pieces. Grind sliced raw mango, green chilli, ginger, garlic, shallot, curry leaves, pepper and salt into a paste. Marinate fish pieces with the ground paste and keep for minimum 30 minutes. Heat coconut oil in a frying pan and fry marinated fish pieces by turning both sides on a medium flame. Serve it hot with onion salad and lemon wedges. If the fish pieces are large, make shallow cut marks on it with a sharp knife, so that the marinade is absorbed easily. Thanks Shaan… this is Annie from Dubai; Im hearing this recipe for the 1st time; fish fry with raw mangoes… I didnt tried this one yet; anyways, will try it soon… Any type of fish is suitable for this?? Is this a keralite receipe or international; or your invention? Annie, This is my own invention You can try it with any fish suitable for frying.